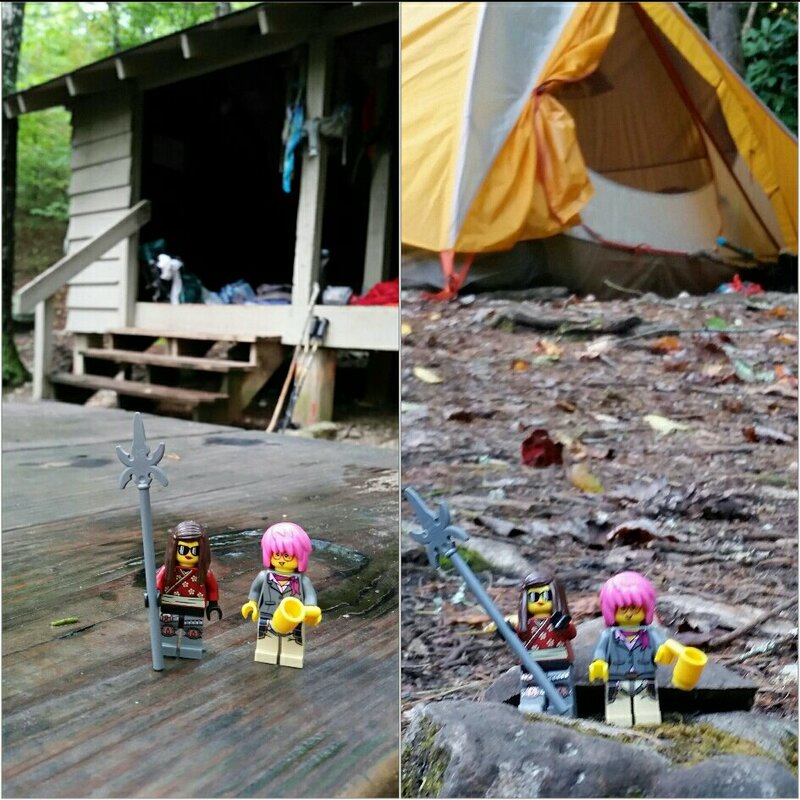 Tiny S and Tiny A decided to share the details of a typical day of backpacking with their hikers on the Appalachian Trail. 7:00 am — Story Seeker wakes up Andowen for the first time. Andowen goes back to sleep while Story Seeker gets the food bags out of the tree and heats water for breakfast. 9:00 am — The Tiny Mes climb into the pocket at the top of Story Seeker’s pack. Another day’s hike begins. 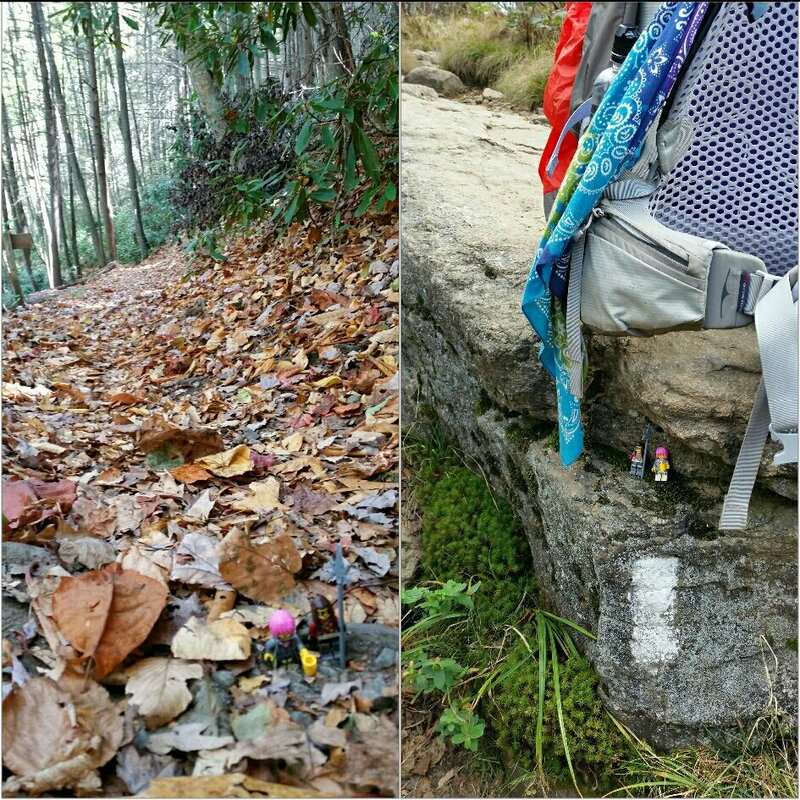 The Tiny Mes help look for white blazes on tree trunks and rocks–proof everyone is still on the right trail! 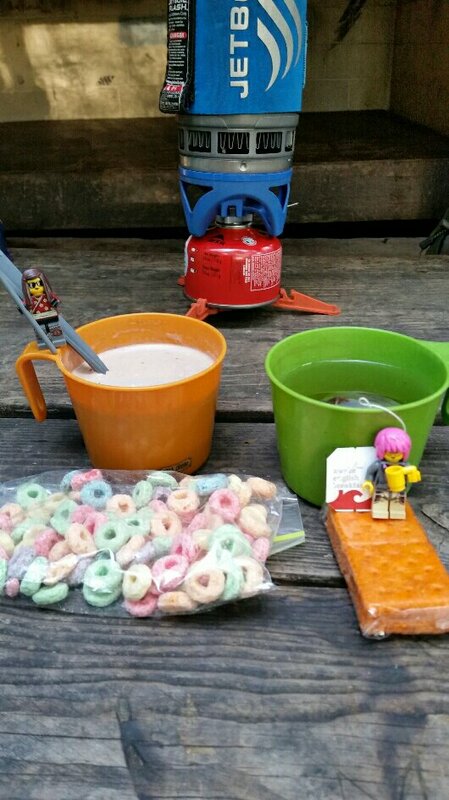 Throughout the day, the hikers eat a snack each hour to keep up their energy: nuts, dried fruit, candy, cheese crackers. 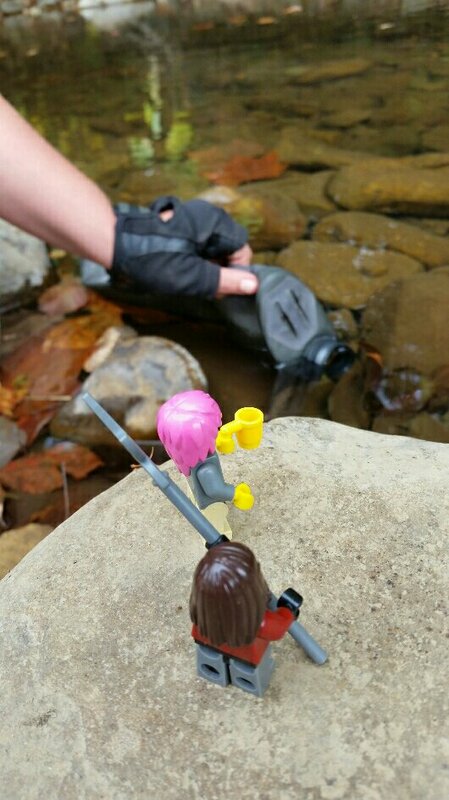 Occasionally they stop to enjoy a view, but water and snacks are consumed while walking. 12:00 noon — the Tiny Mes are restless and demand a break. While they explore, Story Seeker and Andowen eat lunch (a protein bar) and rest for a few minutes. Soon it is time to walk again (before muscles stiffen up!) 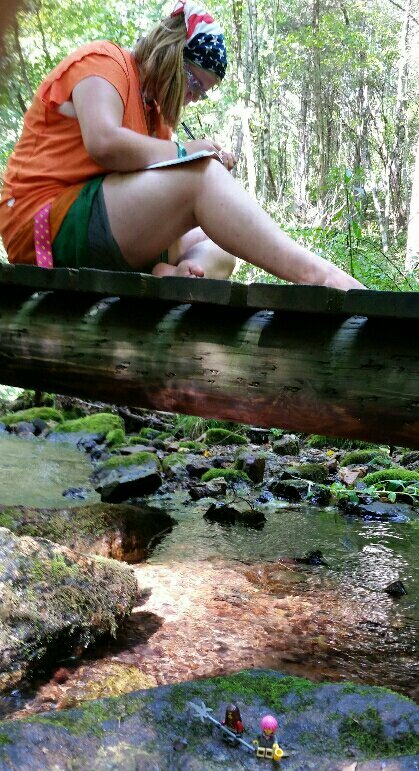 When the seating is comfortable enough or the scenery is especially beautiful, they take off their boots, get out journals or the camera, and fully relax for awhile longer. After lunch, the day’s hiking continues. Story Seeker and Andowen prefer to hike 8-10 miles a day, less than many hikers but just right for them. 4:00 pm — typical time to get to camp for the evening. Frequently, everyone sleeps in a 3 walled shelter. Sometimes, to hit their desired daily miles, Story Seeker and Andowen pitch their tent between shelters. Air mattresses and sleeping bags are spread out, headlamps and journals are set beside beds, and dinner is pulled out of food bags. Dry camp clothes are put on and sweaty hiking clothes are hung to air out. Once everything is organized, it’s time to get water. “Dirty” water bags are filled at a nearby spring or creek then carried back to camp. (4.5 – 5 ltrs are needed each day for breakfast, hiking, and dinner.) Story Seeker filters water while Andowen cooks supper. 5:00 pm — hot food is ready. Other hikers start coming into the camp area as they finish their own daily mileage. The evening is relaxed. Hikers chat, write in journals, read on kindle or phone. 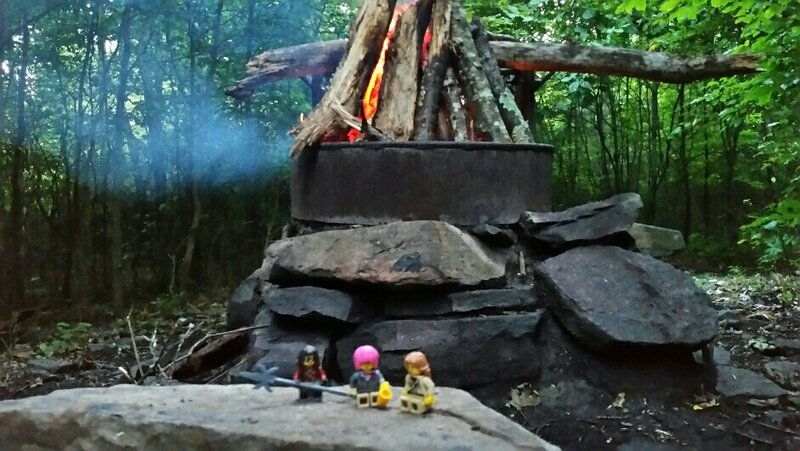 Some nights they play cards (if a deck is found in the shelter) or make a campfire. The Tiny Mes look at the map with their hikers to decide how early they need to get up for the next day’s hiking. 8:00 pm — “Hiker Midnight!” After a long day of hiking, everyone is ready for bed. Goodnight, John-boy! Goodnight, Moon! Goodnight, Tiny Mes!